Individual citrus soufflés make an elegant ending to a meal. The light and fluffy texture is tempting without being too filling and the citrus tang is refreshing to the palate. Soufflés should be cooked at the last minute, just before you intend to serve them, so they may not be an ideal choice when you are hosting a dinner party as well as cooking, unless you comfortable with a longish break between courses, but they are a really impressive finale to a meal if you have the time and inclination. Butter 8 individual soufflé moulds and sprinkle them with sugar, so that they are well coated. In a bain-marie, or a bowl suspended over a pan of just simmering water, whisk the egg yolks with sugar until they are pale and thick. Add the citrus juice and zest. Whisk everything together well, and make sure it is really thick. Whisk the egg whites to soft peak stage. Fold the whisked egg whites carefully into the egg yolk mixture with a metal spoon. Fill each mould ¾ full, then wipe the rims to make sure they are clean, so that the soufflés will rise well. Bake at 200C / 400F for six minutes, until puffed up and golden. Dust the tops with sifted icing sugar. 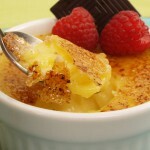 Serve with the Grand Marnier Sabayon from this recipe on the side.